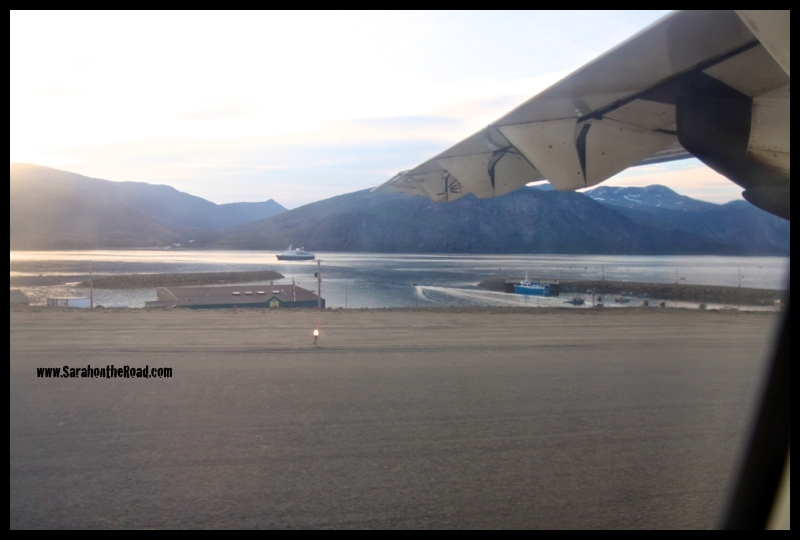 Monday I found myself heading on an airplane to Iqaluit for some training this week. As I sat on the plane listening to the security presentation…I took a glance out the window and realized what awesome perfect light there was! 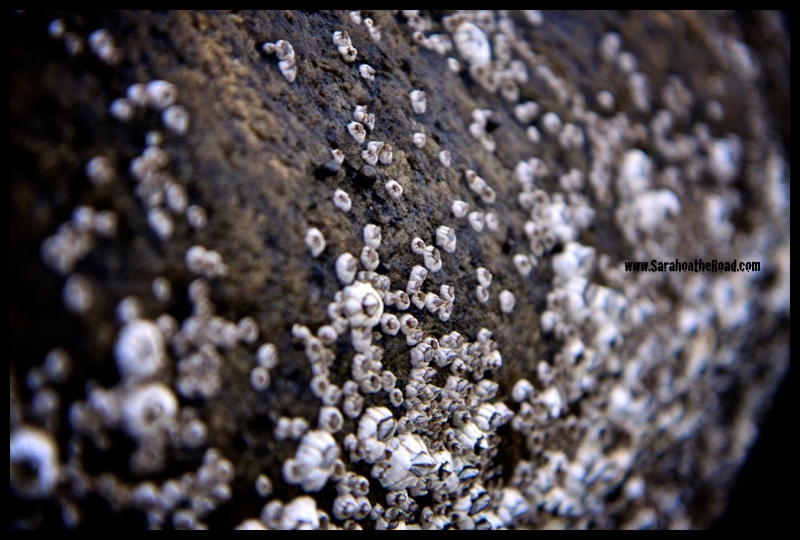 So I decided to take a few snaps… here they are, with just a few words attached today! 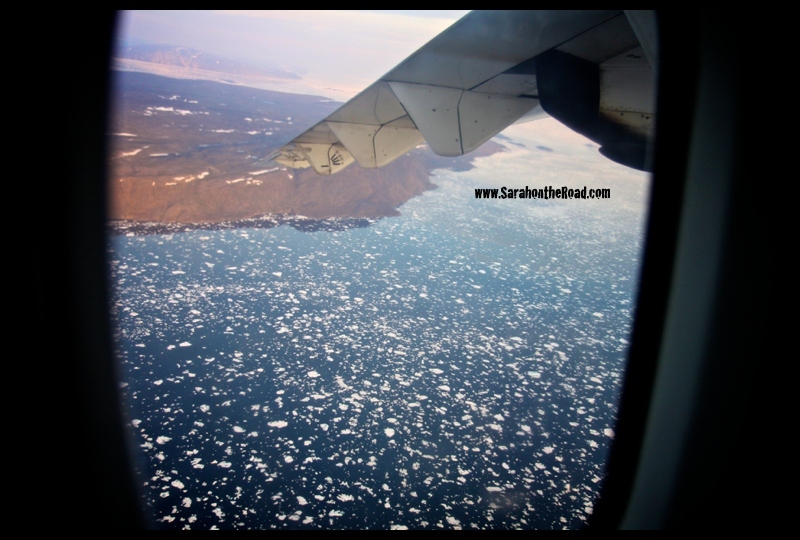 ..I spy…lots of ICE that is blocking parts of Cumberland Sound! Looking out my window it made me realize how awesomely beautiful the land is…it totally puts life into perspective…how we are just one small part of the picture…but there’s so much more happening, you just have to open your eyes to it! 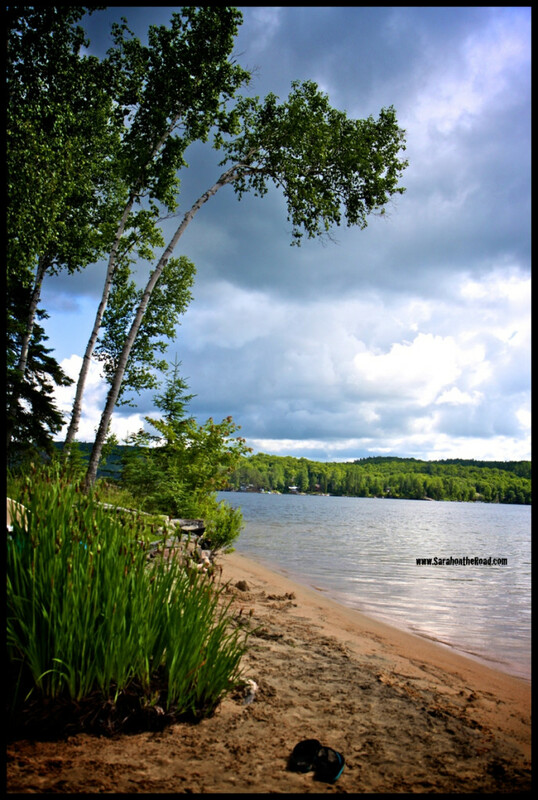 This entry was posted in Wordless Wednesday on July 31, 2013 by Sarah on the Road. Pittarak team: Sarah and Eric McNair-Landry, Katherine Breen and Erik Boomer. 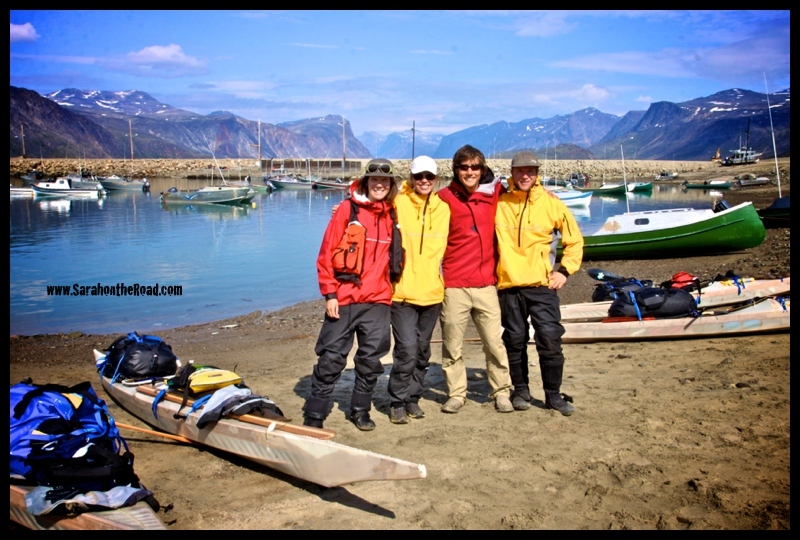 These FOUR awesome adventures were getting ready to head out in their traditional made kayaks on an epic 60 day trek! 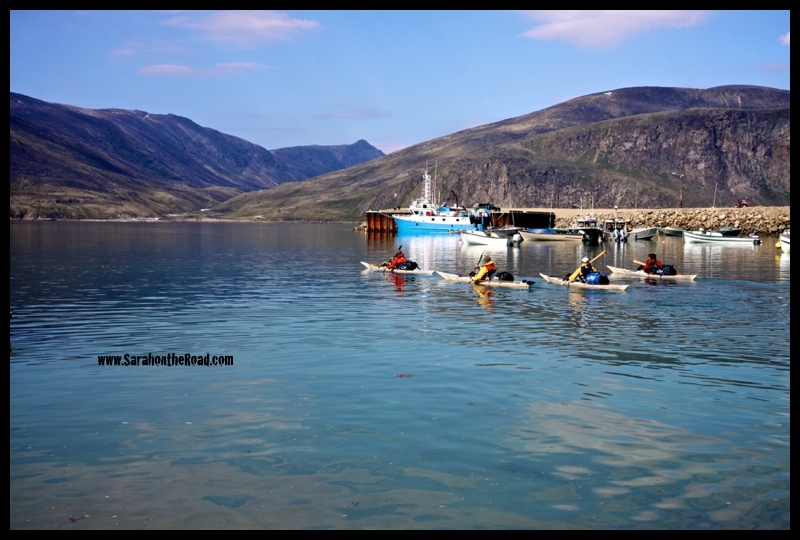 Today just around 1pm the Group took off from Pangnirtung Harbour in the traditional Baffin-style Kayaks. 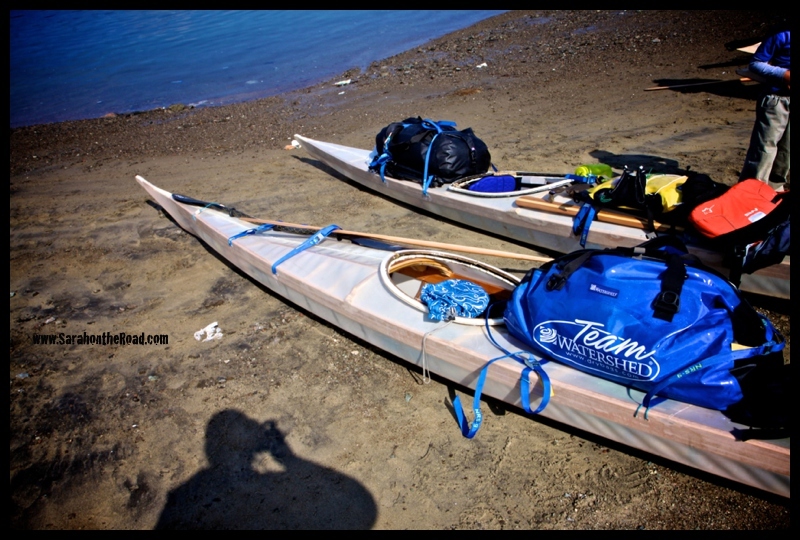 These are Kayaks that the adventures made themselves. Pretty awesome! 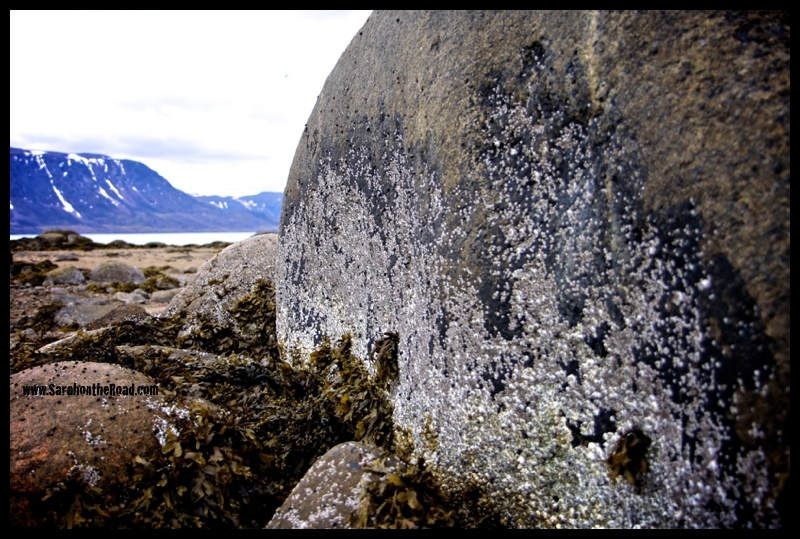 “Qajaqtuqtut” is an expedition that combines history, culture, and adventure. 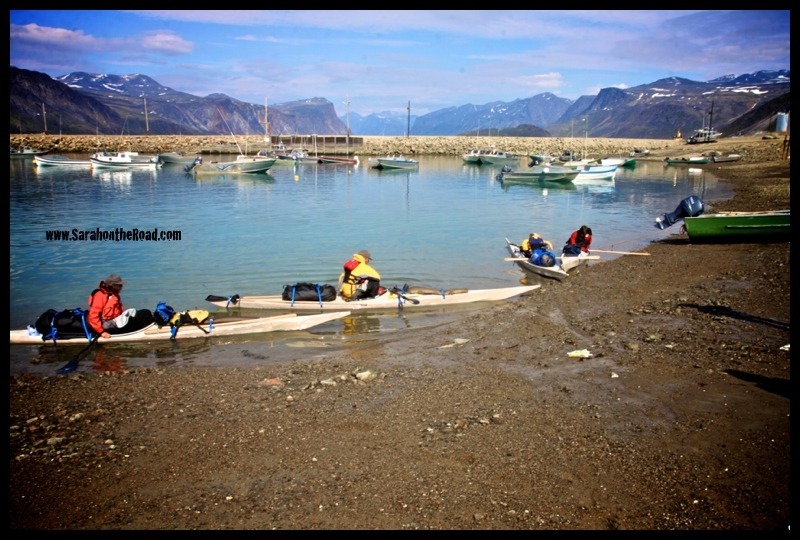 Our team; Erik Boomer, Katherine Breen, and Eric and Sarah McNair-Landry will build traditional Inuit kayaks, and put them to the test on a two month long expedition. 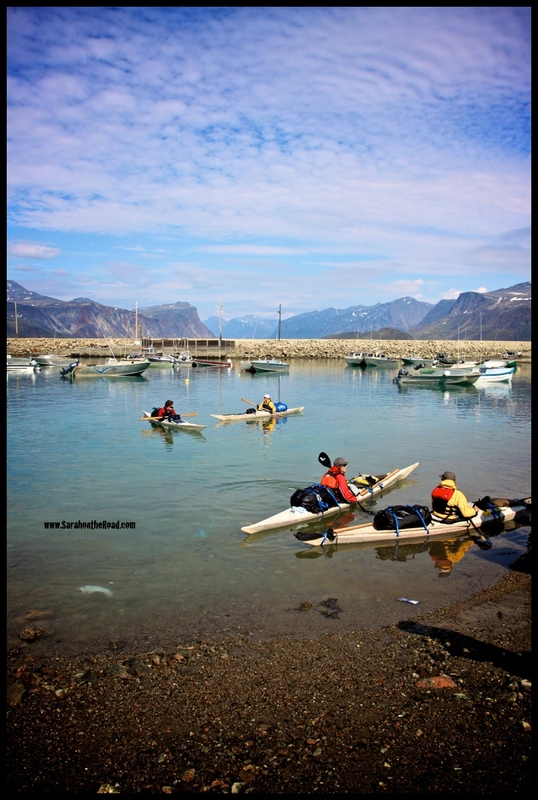 “Qajaqtuqtut” is an Inuit word, meaning they kayak. 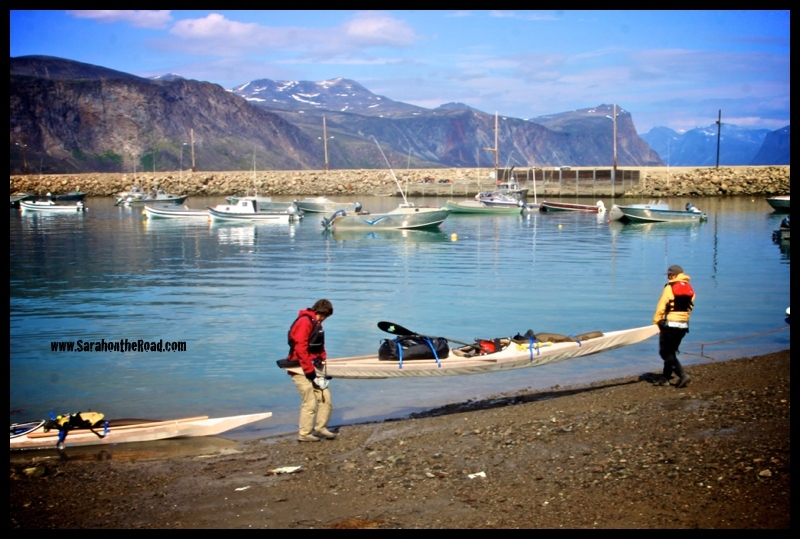 Kayaking traditions in northern Canada, extend back over 4,000 years, but have been in serious decline during the past century. Our aim is to learn and document the skills of traditional kayak building in the hopes of aiding the revival of this diminishing tradition. 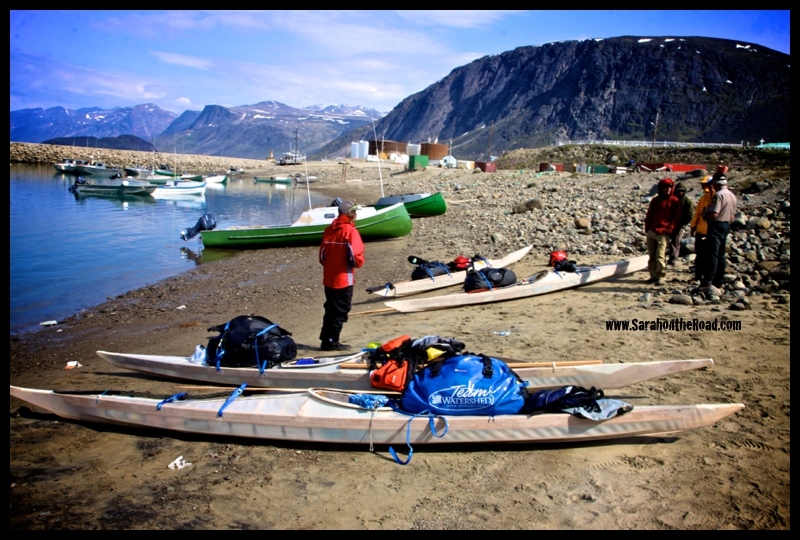 Working closely with young people in Nunavut, we will handcraft our kayaks in an open forum allowing for interactive workshops and hands-on learning for the local community. Once our kayaks are constructed, the adventure will begin. 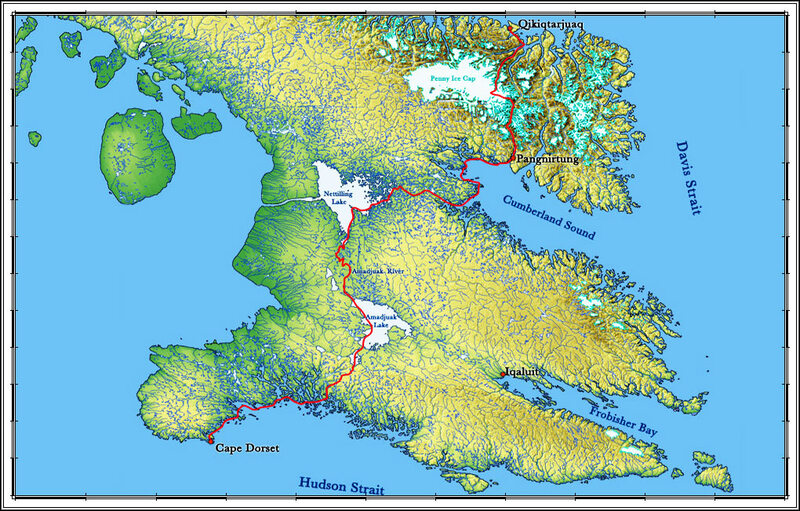 We will put our newly built boats to the test and embark on a 1,000 km journey across the 5th largest island in the world; Baffin. 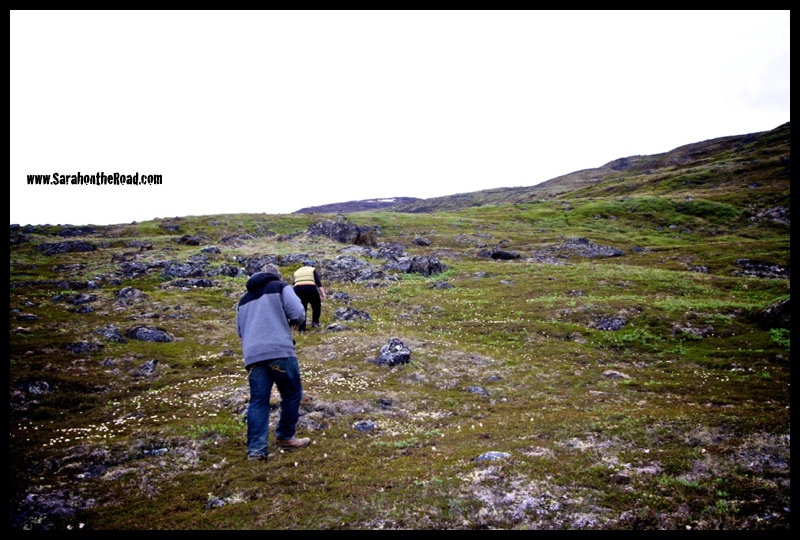 Setting out in 24 hour sunlight from Qikiqtarjuaq we will travel through Auyuittuq National Park, home of the worlds tallest uninterrupted cliff face. 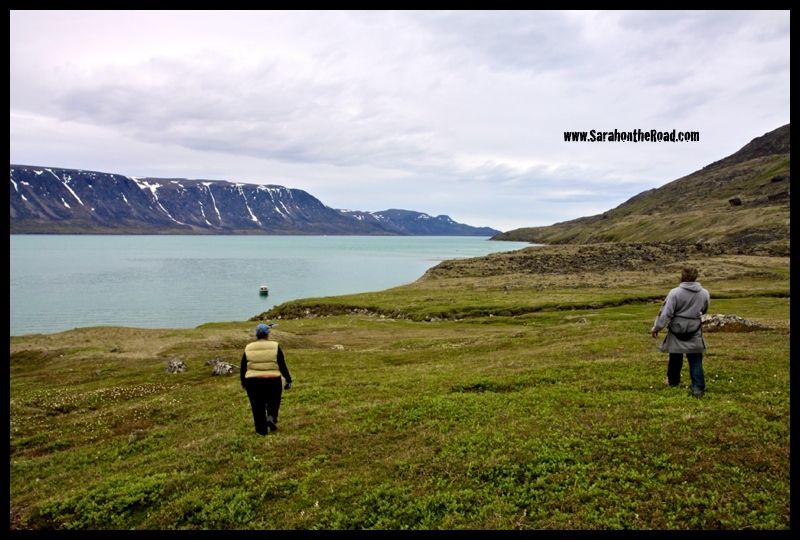 From here, our team will follow traditional hunting routes linking lakes and wild rivers through the interior of Baffin Island leading us back to the Arctic Ocean, and eventually to the small hamlet of Cape Dorset. 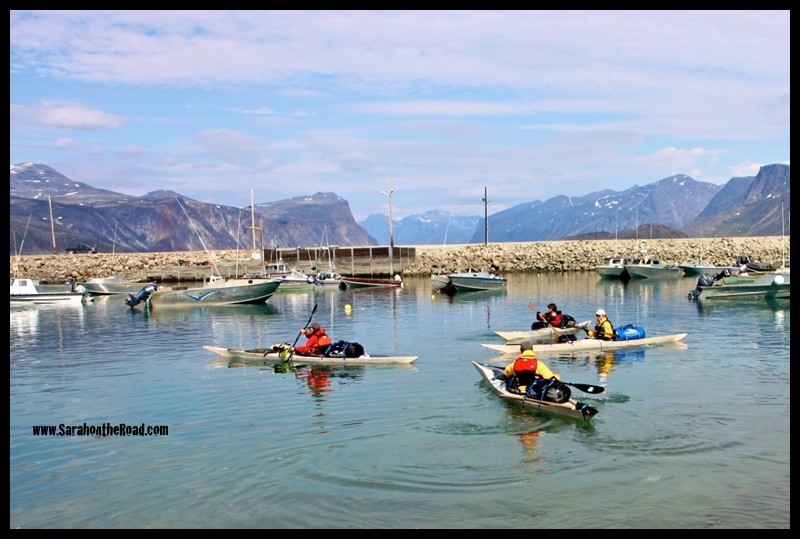 As I was about to head back to work… the team quickly launched their kayaks…and started the next phase of their trip! Sarah, Katherine, Eric and Erik I wish you all the best as you start on this epic trip! I can’t wait to see photos and hear stories from the rest of your journey! If you want to know more about the this epic trip… check out their website! 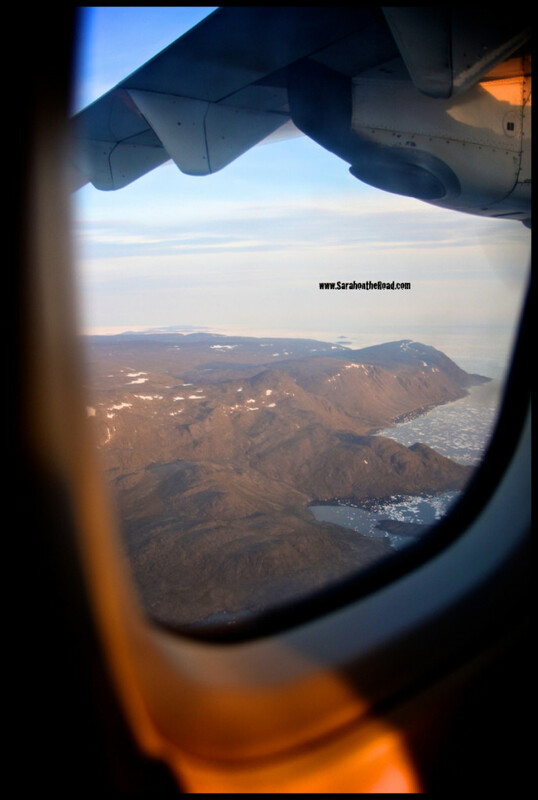 This entry was posted in Life in Nunavut on July 29, 2013 by Sarah on the Road. 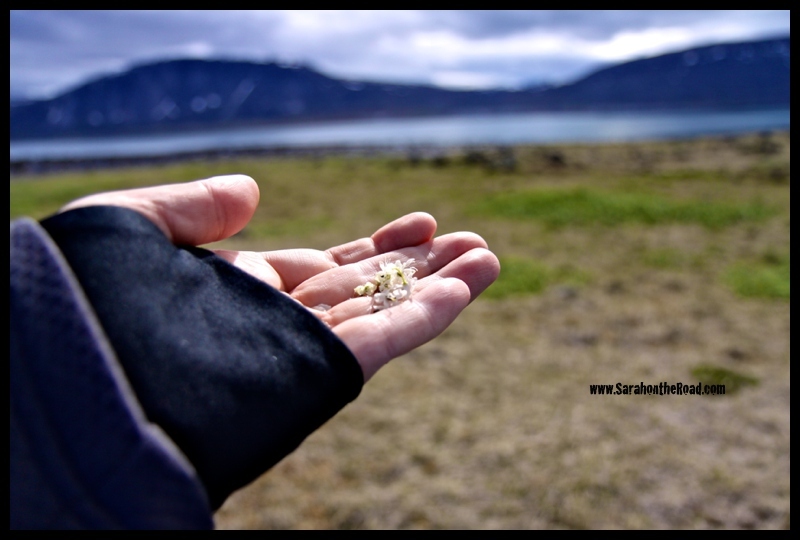 This entry was posted in Birthdays, Family on July 21, 2013 by Sarah on the Road. 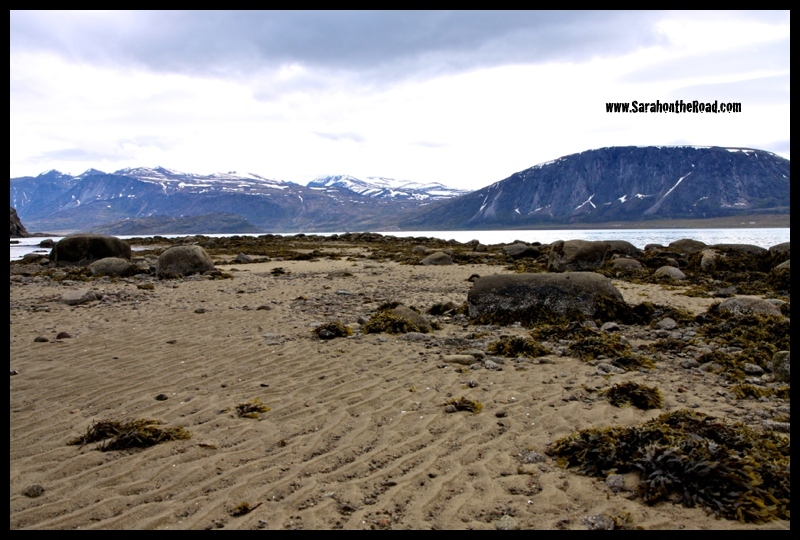 Today I went over to the other side of the Fjord for a hike. The original plans were to camp…but the weather reports for tomorrow weren’t great, so we decided to make it just a day trip! 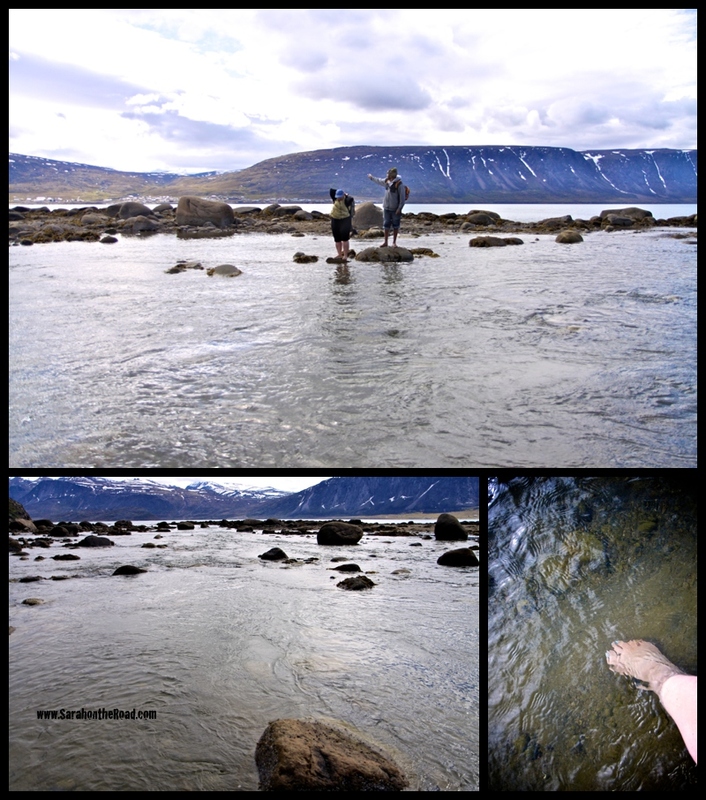 It was low tide when we were dropped off… so that meant we were dropped off at the edge of the tidal plane….and had a bit of a walk/wade through water to shore before the tide came up! 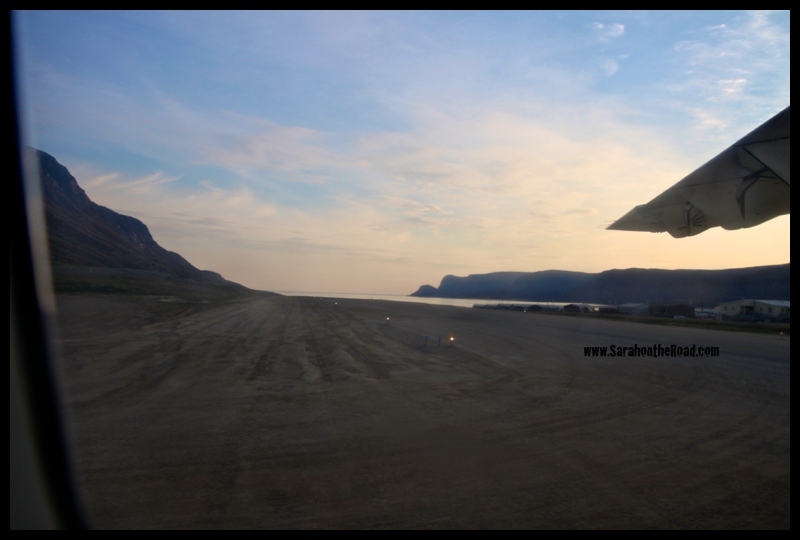 There was a fabulous beach were we were dropped off…. it’s amazing that 1/2 the time this is many feet under the water! …so when we figured that the water wouldn’t go down anymore with the tide, we took off our socks and shoes…rolled up our pants…and walked across the FRIGID water. The first few steps were horrible, I’m not going to lie… but after a bit my feet/legs were numb…and the water seems strangely warm! The walk was worth the view! mmmm Labrador Tea…smells so good. 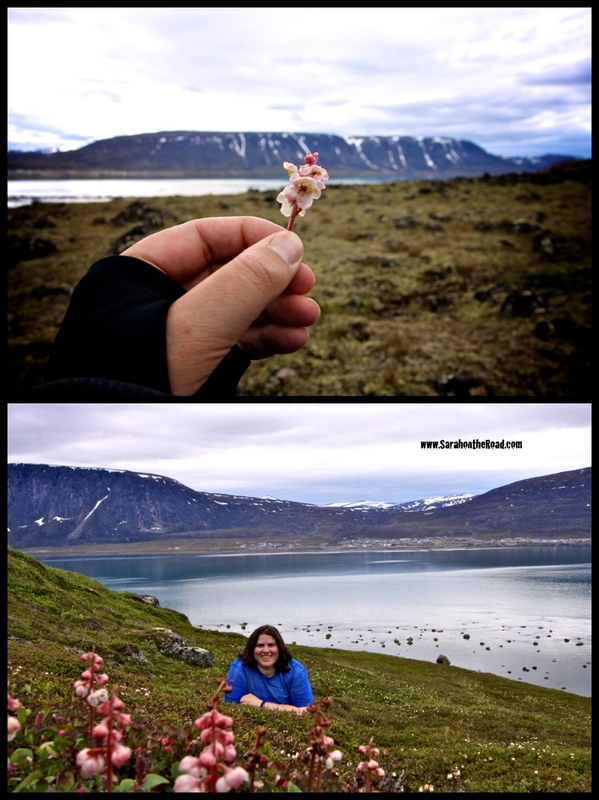 The tundra was filled with this flower (plus others) and it smelt so good! 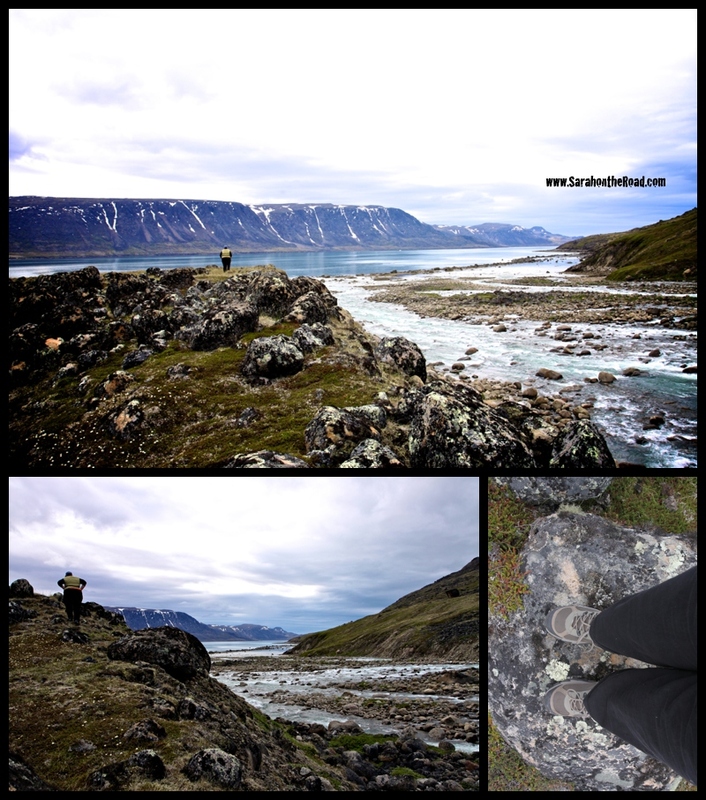 We all walked over to check out the Kuulik River…it was rushing and a welcome sound! 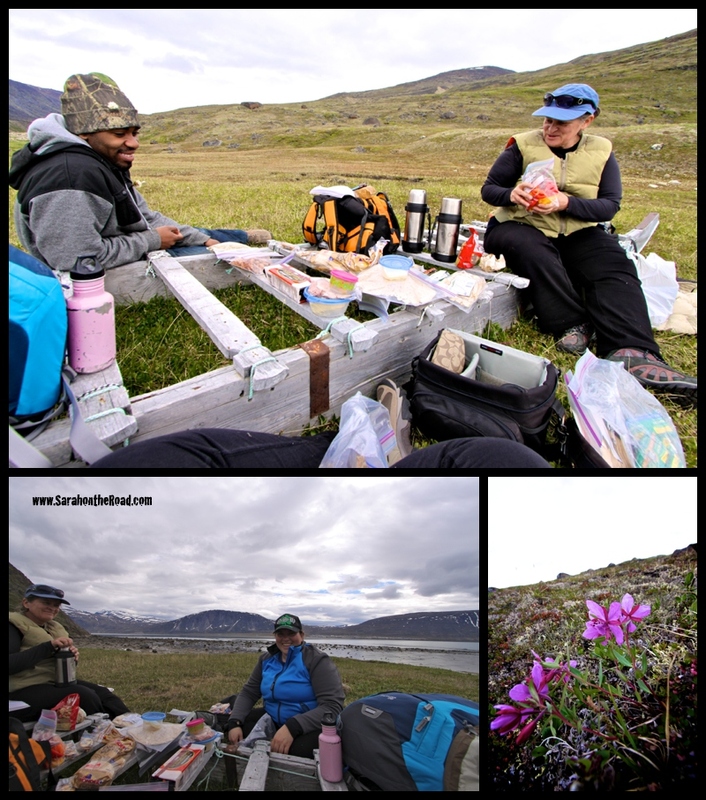 We headed back to where we dropped our bags… and had a bit of a lunch feast… because we thought we were camping overnight… we had a smorgish board of food to choose from! 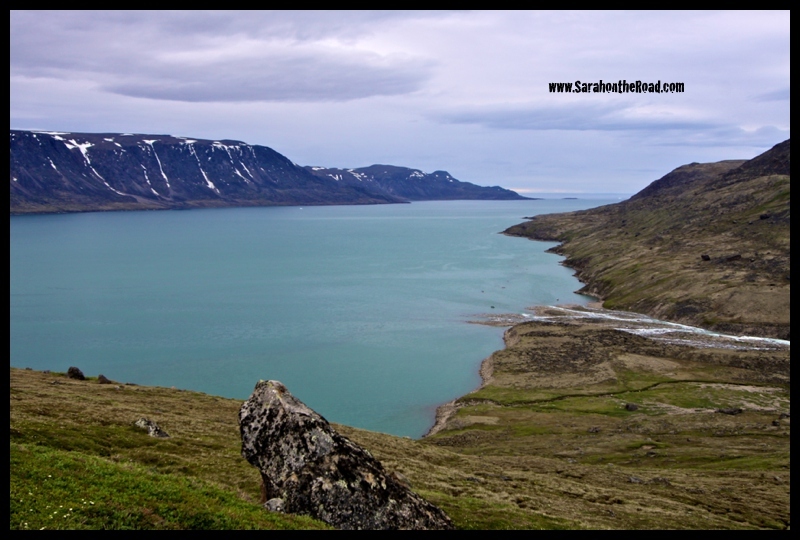 After lunch we took a bit of a hike up the hill/mountain on the right of the Kulik River. 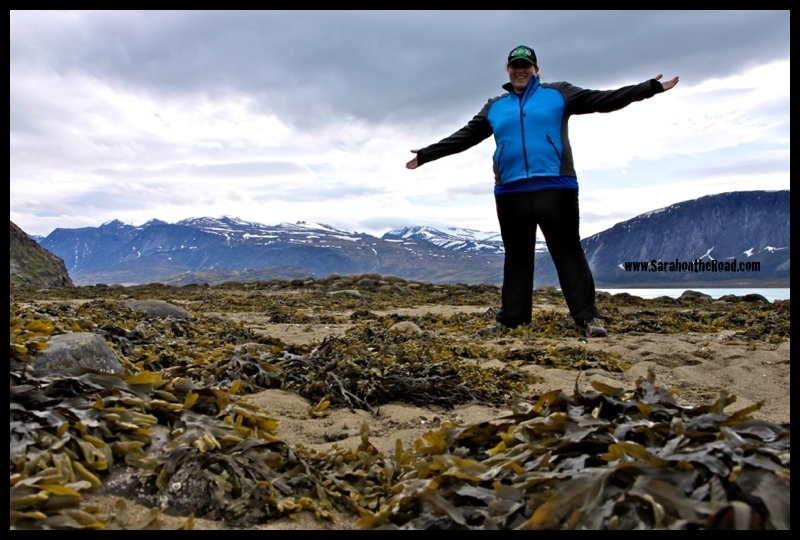 Just wanted to show the perspective of how small the flowers really are in the photo below where Pangnirtung is in the distance on the other side of the fjord. 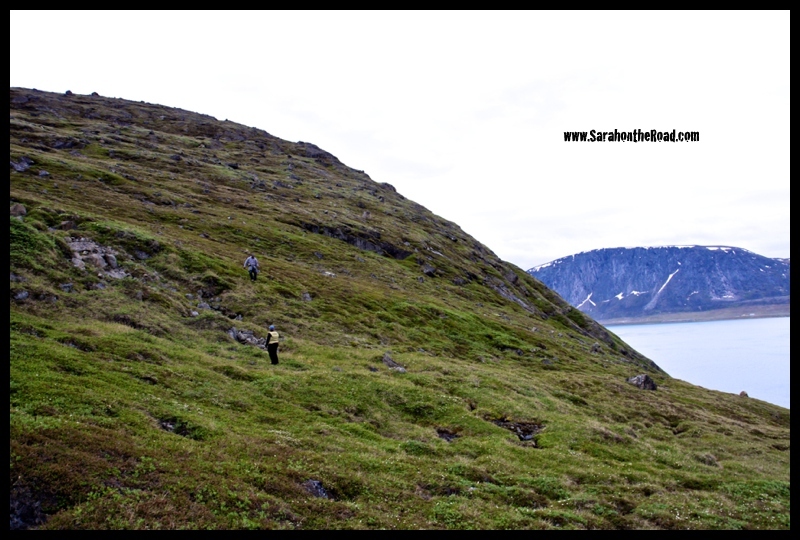 After my break I continued up the hill to join my friends… again! 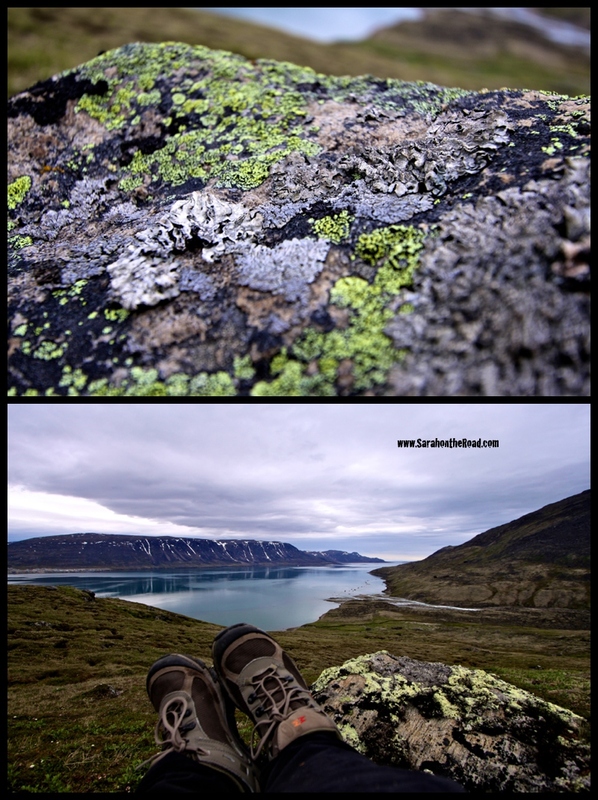 My one friend had been here hiking 2 weeks ago…and lost her camera on the way down the hill…so we spent time looking for it. We had both come down different routes… and didn’t see it… but our 3rd friend FOUND IT! That was almost like finding a needle in a haystack… such crazy awesome luck! This happened literally 30mins before we got back on the boat! 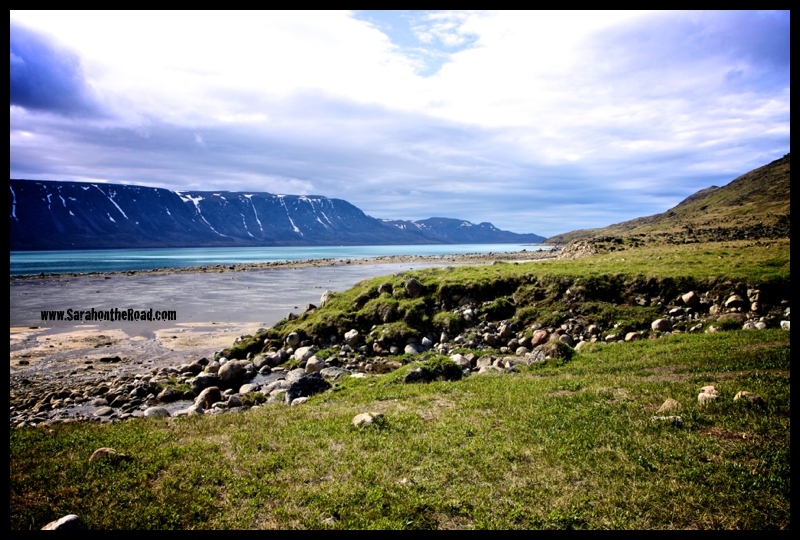 It was an awesome day… I would love to go back and camp there overnight at some point! 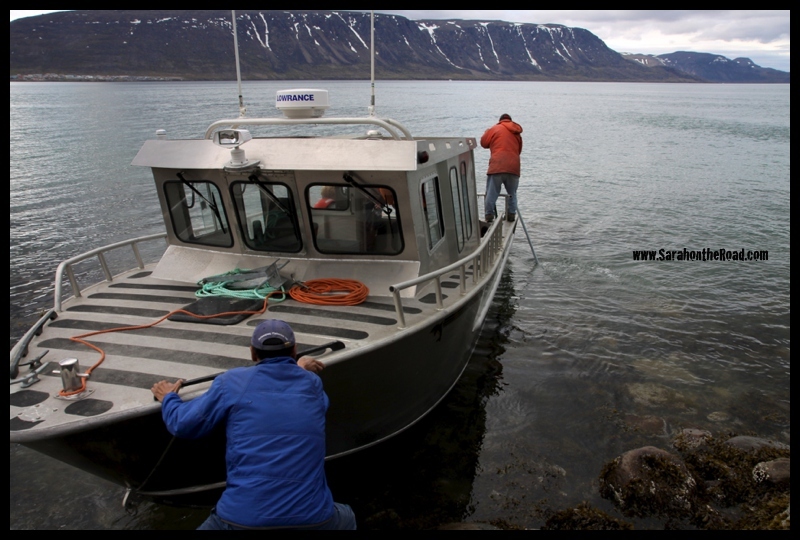 BUT I think I’ll make sure we get dropped off at high tide…then the boat can drop us right at the shore! It was an awesome day…spent with great friends, thanks for the invite! 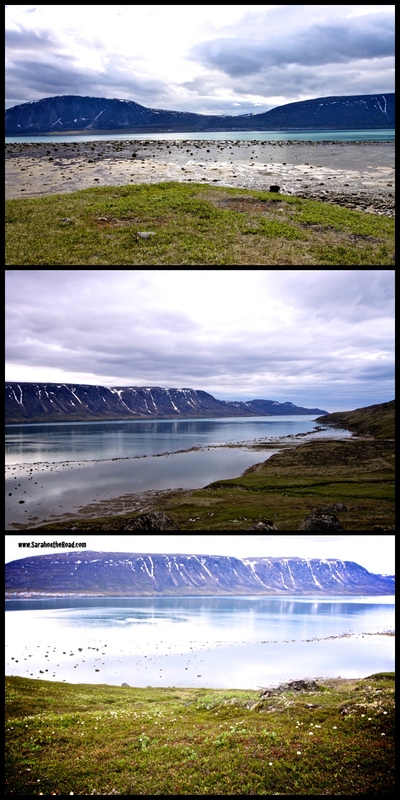 This entry was posted in Life in Nunavut, Walk in the 'hood on July 20, 2013 by Sarah on the Road.